I love collaborating on creative projects– collaborating with other bloggers, collaborating with friends, collaborating with my kids and collaborating with my husband! Karen and I often have “blue sky meetings”. We go into the meeting with no agenda in mind, the primary purpose is to bounce ideas off of each other, brainstorm and come up with collaborative projects. I’ll be honest, The Hubs and I don’t get out on many dates. We don’t have family in babysitting distance, and by the time you pay a babysitter on top of your date night, it gets really expensive. Sometimes it feels like a splurge that we just can’t make. So instead of date nights, sometimes The Hubs and I work on a creative project together. It’s a really fun way to reconnect,work on our teamwork skills and create something together! In most relationships, each person brings different skills to the table. I’m definitely the visionary… I can see amazing things in my head but sometimes I don’t have the patience to thoroughly investigate the “proper” way to do bring my vision to life. I’m impulsive and like to see my vision brought to life… NOW! The Hubs is more of a planner. He loves researching ideas but then he sometimes just lets that idea sit… and sit… and sit. He always goes into a project knowing exactly how he is going to do something and the “right way” to do it. The two of us make a really good team. I come up with a big idea, he reigns me in and makes it more achievable, he researches how to do it, I push him to take those skills and bring them to life, and then I put on the finishing touches. The Hubs loves beer, in particular craft beer. There is a huge craft beer scene in Washington where my family lives (there are gas stations where you can bring your glass growler bottles and fill them up with local craft beers) and the craft beer scene is growing in BC as well. As a special treat, my husband will buy a growler from a brewery and enjoy the beer with friends and family. Craft beers in growlers are definitely a social thing, and we often will bring a growler or two when we go to a friend or family member’s house for dinner. Having a carrier to carry your growlers in, 1. Keeps them from rolling around in the car. 2. Kind of makes you look cool. Wink, wink. 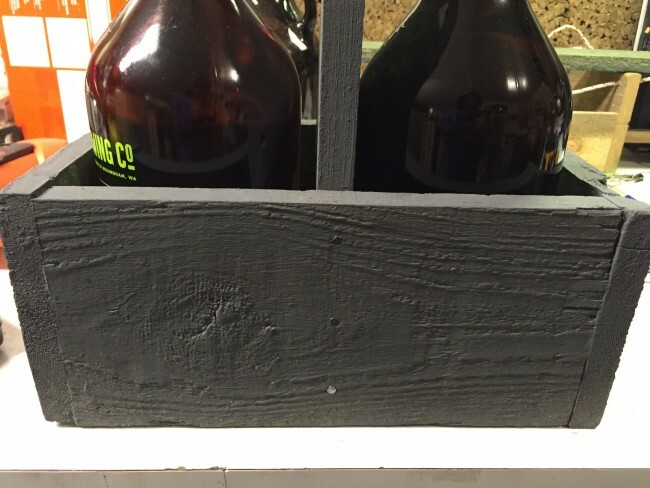 The Hubs and I decided to share with you today how to make a handmade growler carrier. Add a couple of growlers to this handmade growler crate and you’ll have a fabulous handmade gift for the beer lover in your life! I’m going to hand things over to The Hubs now, and I’ll be back when it’s time to paint and decorate! Sand Paper and/or wood files of various sizes. 2. Fasten the sides to the bottom board. Place side piece alongside the bottom piece lengthwise. Carefully drill three pilot holes using a 1/32 drill bit spaced evenly. Remove side pieces and lay down a bead of glue along the bottom piece edge. Fasten the two pieces together with nails through your pilot holes. Repeat of the other side. 3. Fasten the end pieces. Place end piece on end of box. Carefully drill three pilot holes using the same bit as above along each side of the end piece, as shown. Remove end piece and lay down a bead of glue one the end of the side and bottom pieces. Growler carrier after steps 2 & 3 are complete. 4. Cut out the trapezoid shaped handle. Measure 1 1/4” down from the end and draw a line perpedicular across the board. Measure 1 1/8” in along the line from each side and make a mark. Measure 2 3/4 “ down from the same end and draw a line perpedicular across the board. Measure 1” in along this second line from each side and make a mark. Draw a line from the marks on the top line to the second line to make a trapezoid box. Using a drill bit bigger that your jigsaw blade, drill starter holes in the trapezoid shape. Use your jig saw to cut out the handle. 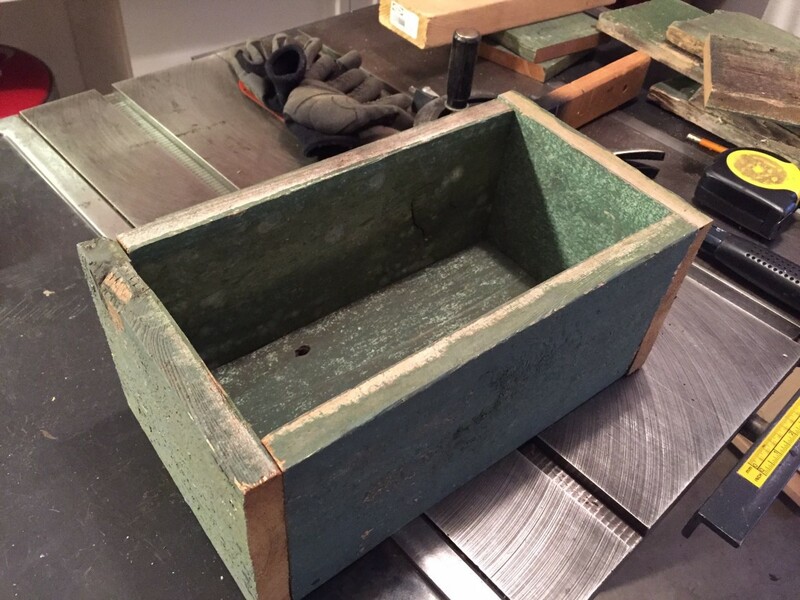 Shape the holes using files and/or sandpaper to smooth the edges. 5. Fasten the handle to the box. Measure 6” in from one end of the box and mark on both sides. Insert handle lining up with marks. Drill pilot holes using 1/32 bit on each side making sure to centre them exactly with the middle of the handle, as shown. Remove handle and lay down a bead of glue along edge of handle. Reinsert handle and fasten the two pieces together with nails through your pilot holes. Your growler carrier is now built! Now I’m going to hand the reigns back over to Crystal for decorating! 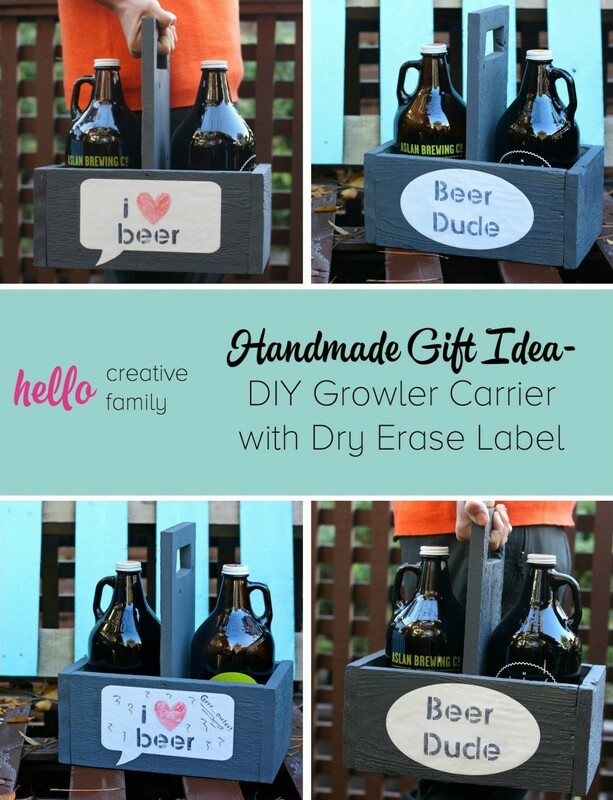 Painting and decorating is when you can really customize your growler carrier to whoever you are going to be giving it to. I liked the rustic look of the wood, but wanted it to be a bit darker, so I roughly sanded it, then applied a coat of Americana Decor Chalky Finish in Relic. I thought having a dark, rustic look would be good for the beer drinker in my life. Of course, you know if I’d been painting a wine carrier for myself it would have been aqua blue. ;) I left the carrier to dry and started working on the dry erase labels. I turned to my Cricut Explore to cut out my dry erase vinyl. I chose a conversation bubble for one side and an oval for the other. While I was in design space I also created some beer stencils to use on the dry erase portions of the carrier. You can access my cut file here. Once the carrier was dried, I gave it another light sanding to rough the paint up a bit, stuck the labels on and stenciled on them with dry erase markers. Voila! Your carrier is complete! The Hubs thought it would be funny to write Grrrr…owler on the label. I thought it was pretty funny too! So what do you think? Tell us… Do you have a beer lover on your gift list? 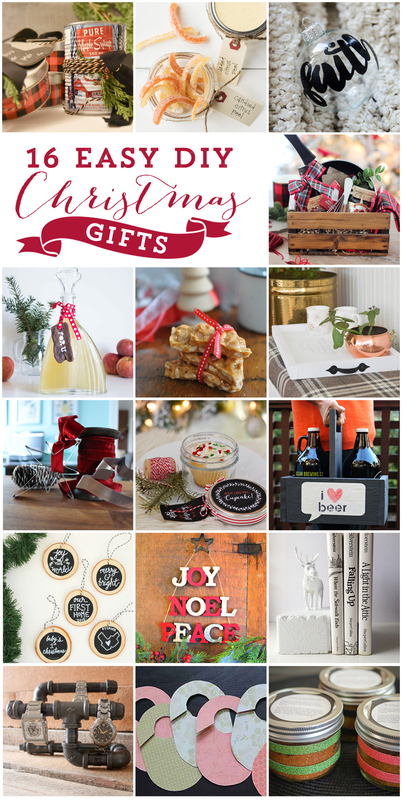 I teamed up with some of the best DIY and Craft Bloggers in Canada to bring you 16 handmade gift ideas! Check out what my friends created! DIY Maple Candle (A Roots Knockoff) from Vin’yet Etc. « 27 Christmas Activities for Kids- Crafts, Ornaments, Decor and Creative Play! Great idea! My husband buys growlers every time we drive through Jasper! Thanks for the inspiration! What a great idea for a date night, love the idea of reconnecting over a shared project. Thanks for sharing. So much fun! I know a few guys in my life that would love a carrier for their growlers! These would be the perfect gift for my uncles! Put in some Oregon 7 Devil’s Growler’s in them and I’m gold! Thanks! This is so gorgeous! So handy! This will be a little bit more difficult to make but it would be well worth the while! These are really cute and would make a great gift! Thanks so much! This would be a PERFECT gift for my husband! Thank you so much for the inspiration! Thanks so much for sharing your creativity at the The DIY Collective this week! Please come back next week to show off your latest project! I love that you two designed this together, what a great way to hang out! Thanks for sharing at #HomeMattersParty! Brilliant! 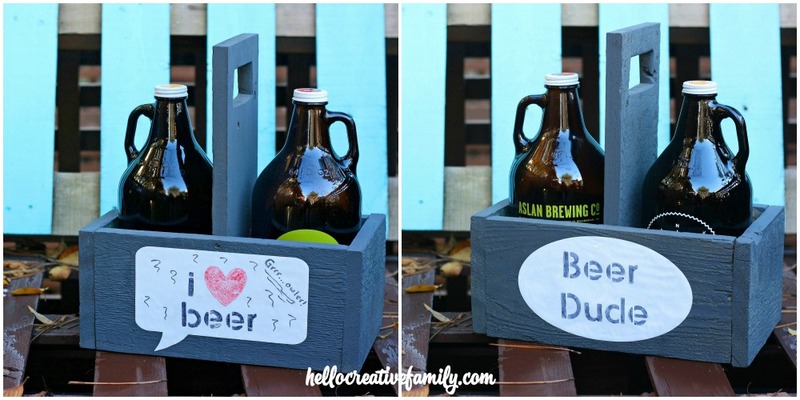 I love beer, so perhaps I’ll make one for myself :) OR I could be really nice and make one for my hubby – we have about 6 growlers in the basement as I type :) Thanks for sharing this, found you at Monday Funday, pinning and sharing! Hope you’ll visit us again! Thank you so much Mila! This made my day! I submitted another link this week. Thanks for the great link party. Love this. So many possibilities with that box. Thank you for linking up to Tips and Tricks. I hope to see you again this week.